iPlayer on Windows Phone 8 - whatever next? 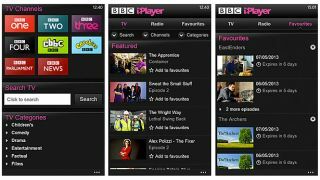 If an iPlayer live tile is just the thing to finish off your Windows Phone 8 home screen, then we have excellent news: the BBC has just launched an iPlayer app for WP8. Well, we say app. It's really just that shortcut to the mobile website that it promised back in March, but the Win-Pho-friendly iPlayer does offer a live tile and makes use of the service's media player. Unfortunately, despite the BBC's original hope that the app would work across Windows Phone 7.5 too, it won't. The Beeb cites 'platform limitations' as the reason for the snub, and means that those of you on older Windows Phones won't be able to use iPlayer at all. "Although this is disappointing," writes head of iPlayer Dave Price, "Windows Phone 8 currently make up the majority of all Windows Phones on the market and this number is expected to grow. "I therefore hope more of you will get to enjoy BBC programmes on the go with iPlayer with Windows Phone 8 devices."